Often referred to as the city of music, Vienna is a stunningly beautiful capital that just lends itself to being explored by bike. 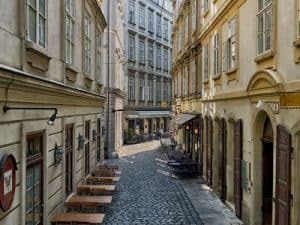 It’s a city where the past meets the present, with some incredible architecture, masterpiece museums, astounding arts programs and cutting edge wining and dining you’ll want to indulge in after a long day on your rental bike in Vienna. 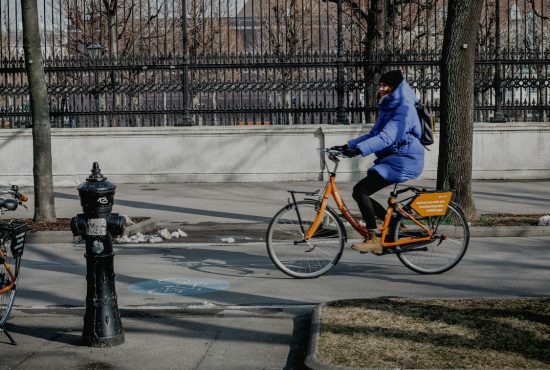 Vienna has recently embraced cycling culture and is now dedicated to improving its infrastructure, so there’s no better time to get on your rental bike and see the city. This one is steeped in history, having been for centuries a seat of power for the Romans, after which came the Austrian and Austrian-Hungarian empires. 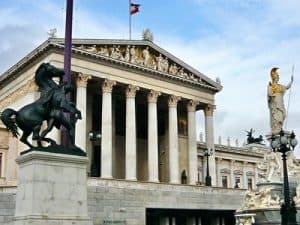 As such, you can feel the realness in Vienna reflected in the imperial architecture, the multitude of baroque artwork and sculpture, and even the very manner of its citizens. 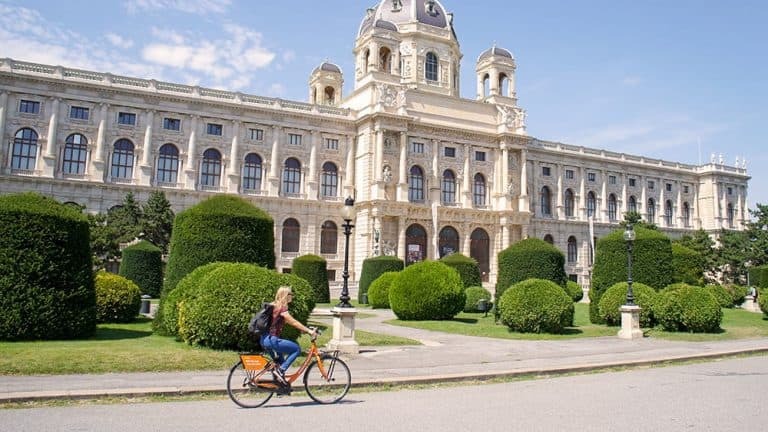 Vienna (or Wien – as it’s more locally known) is a manageable capital of around 1.8 million people, and you can easily see the main attractions within half an hour with your rental bike. If you’re not sure where to start, don’t worry: there’s practically a non-stop festival of cultural events too, so you’re never going to be short of things to keep you occupied at any time of the year. But if we had to choose the best season to visit, cycling in Vienna in the summer is a real delight. The streets come alive with people and the parks blossom into vibrant, social hangouts. 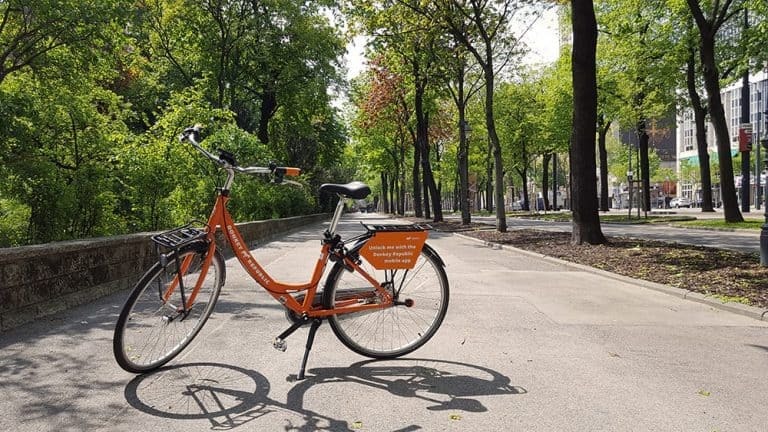 Our first port of call for your rental bike in Vienna is the popular Prater, which is a large park and green space in the 2nd district, housing a variety of attractions. Perhaps the most famous of these is the Wiener Riesenrad, Vienna’s iconic Ferris wheel, which is a symbol and landmark of the city, and a star in numerous Hollywood movies. It towers over another point of interest in the Wurstelprater, which is the oldest amusement park in the world, and a firm favourite with adults and children alike. Spend a day biking the park’s cycle tracks, and then stuff yourself with delicious specialities at Schweizerhaus – arguably Vienna’s most famous restaurant. The inner ring (or Ringstraße to give it its proper title) is a boulevard-style ring road that encircles the historic area of the city – which is incidentally also a UNESCO world heritage site. 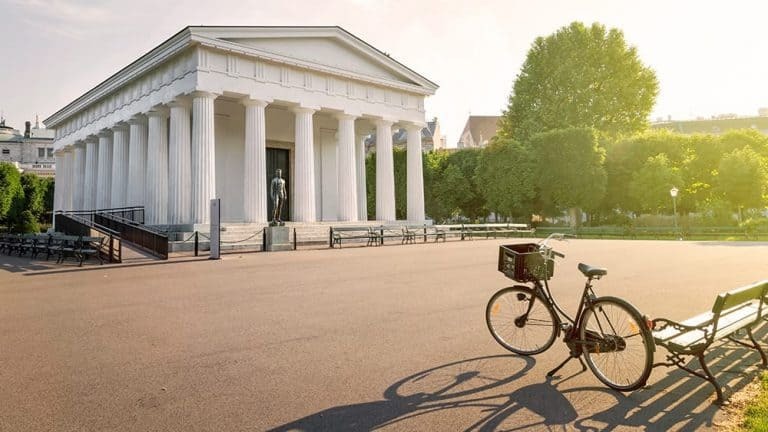 Take your Vienna rental bike on the purposely-built sightseeing cycle path, and experience some of the best architecture the city has to offer. 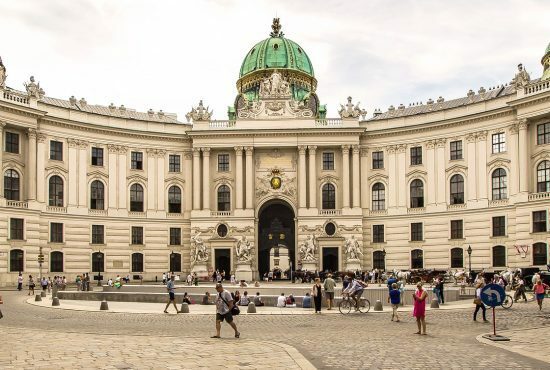 Marvel at the imposing Hofburg Imperial Palace, and the Academy of Fine Arts nearby. 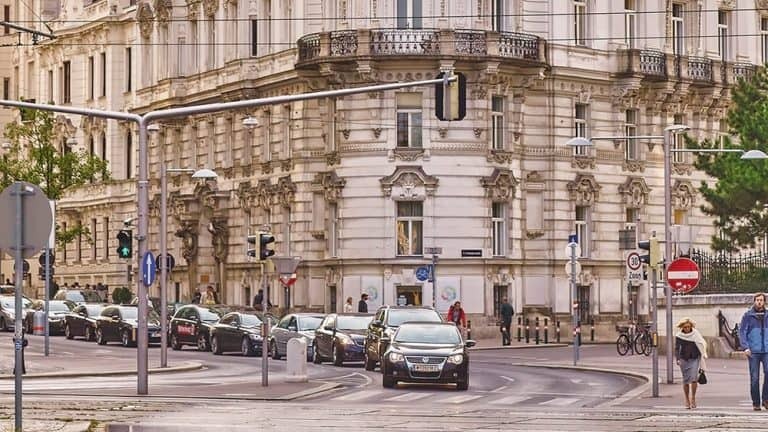 Cycle past the stunning Rathaus, Vienna’s neo-gothic city hall, and stop a while in the museum quarter, one of the largest of its kind in the world. And don’t forget the beautiful Vienna State Opera house where you can catch a performance – although you might want to bike home and change your cycling clothes first! There’s so much grandeur and spectacle on this boulevard, that they don’t call this “lord of the ring roads” for nothing! If you prefer to get out of the city, head to the Donauinsel, which is a long, narrow island in the Danube. At 21 kilometres long, it’s a paradise for your bike rental in Vienna, boasting an abundance of cycle tracks to explore. It’s only a few minutes from the city centre on the U-Bahn too and has become something of a recreational retreat enjoyed by locals and tourists alike. There’s a wealth of bars, restaurants and nightclubs, as well as popular beaches and bathing spots. With such an exciting mix of sporting and drinking establishments, the Donauinsel becomes one big festival every summer; but our favourite has to be Danube Jumping – the largest trampoline centre in the world. Go on – you know you want to! The OeBB Austrian Federal Railway has some awesome services for cyclists – use them! 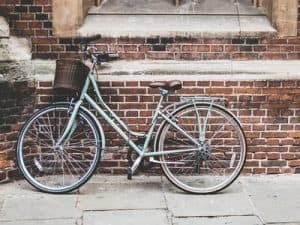 Wearing a bike helmet is required by law for children who are aged 12 or younger.